Includes one hanging tire with an animated reaper prop in the center. This decoration measures 16" tall and 16" wide. The reaper features head movement, mouth movement, light-up eyes, and haunted sounds. 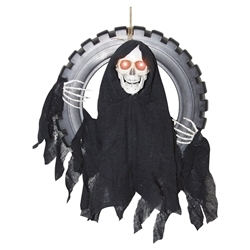 The animated reaper tire swing Halloween decoration can be used for your haunted house, a playful graveyard theme, or decorating for Halloween night.